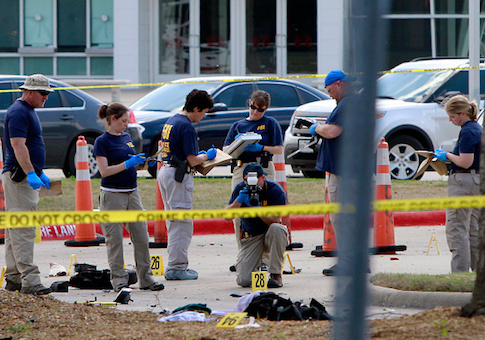 The FBI and the Department of Justice are arguing for a liability case against them to be dismissed, while at the same time admitting to key details surrounding the bureau's involvement in the 2015 terrorist attack on the "Draw Muhammad" event in Garland, Texas. In that attack, the first in the United States for which ISIS claimed responsibility, Elton Simpson and Nadir Soofi, drove to the Curtis Culwell Center in Garland in a car loaded with six guns and over a thousand rounds of ammunition. The two men opened fire when they were stopped at a perimeter checkpoint. A security guard, Bruce Joiner, was shot in the leg and the two attackers were killed just yards away from where the shooting began. Joiner filed suit last October, claiming the FBI was partially responsible for his injuries. His suit argues the bureau "solicited, encouraged, directed and aided members of ISIS in planning and carrying out the May 3 attack," and is asking for just over $8 million damages. Court filings from Thursday confirm that an undercover FBI agent was in a separate car directly behind the attackers when they opened fire, and that the agent, "was dressed in Middle Eastern attire and police almost killed him, but he saved his life by claiming to be an FBI agent." Lawyers with the Justice Department are asking the court to dismiss the case, arguing that the FBI is immune from liability under the Federal Tort Claims Act. The origins of the attack stretch to Paris, France, in January of 2015 when radicalized Islamists killed 12 people at the offices of the satirical magazine Charlie Hebdo for the magazine's depictions of the Prophet Muhammad. Fewer than two weeks after the Charlie Hebdo attack, an Islamic group held a conference at the Culwell Center in Garland, called, "Stand With the Prophet in Honor and Respect." As a counter to the Islamic conference, self-described "free speech advocate" Pamela Gellar organized the "First Annual Muhamed (sic) Art Exhibit and Contest," also to be held at the Culwell Center, slated for May of 2015. Simpson and Soofi were part of a small cell of radical Islamists in the Phoenix area, which the FBI had been monitoring. An undercover agent, identified in Thursday's filings only as "UCE-1," had infiltrated the group for some time and had been in communication with Simpson. Simpson: Bro, u don't have to say that…U know what happened in Paris…I think…Yes or no…? Simpson: So that goes without saying…No need to be direct. A 60 Minutes exposé last March first revealed that the undercover agent was in a separate car directly behind Simpson and Soofi when the attack began, that the agent was taking pictures of the pair just seconds before they opened fire, and that the undercover agent tried to flee the scene once the attack began but was apprehended by local police. The government's only comment in response to the 60 Minutes report last March was to say, "There was no advance knowledge of a plot to attack the cartoon drawing contest in Garland, Texas." Joiner's attorney, Trenton Roberts, says his client sued in an effort to get to the bottom of the FBI's involvement in the attack. Roberts says there are only two explanations of what transpired that day with the undercover agent. "It seems like it had to have been one or the other," Roberts told the Washington Examiner. "Just a complete botched operation where they [the FBI] don't want the attack to actually take place, or, it's something where they need the attack to take place in order for this guy [the agent] to advance in the world of ISIS." "And that's really what I think. I think that they thought, ‘he's undercover and in order to advance, he needed to get pictures or video of this attack,' and then that would bolster his street cred within ISIS," Roberts said. The government's response claimed that Joiner's lawsuit, "provides only rank speculation that UCE-1 met up with and followed Simpson and Soofi to the event, and provides no well-plead factual allegations regarding what exactly UCE-1 did at or immediately before the event that could constitute the assistance, direction, solicitation, or encouragement of an assault. Rather, the only communication Plaintiff can point to as a basis for the assault claim is the comment to ‘tear up Texas." The curiosities surrounding the case have drawn the notice of some congressional leaders. Ron Johnson (R., Wis.), chairman of the Senate Homeland Security and Governmental Affairs Committee, complained in April of last year that he was learning details of the FBI's involvement in the attack only through the media, and two years after the fact. "We've been trying to have oversight on all of these terrorists attacks in the United States, so we can do an after-action report to see if some of the FBI procedures should be changed so we can prevent these things from happening in the future," Johnson said in a report by Fox News. In a hearing before the Senate Judiciary Committee last May, Senator Ted Cruz (R., Texas) pressed then-FBI Director James Comey on the Garland attack and the 60 Minutes report. "I can't go into the details of it here, because they're classified, but I think a fair thing to say is the media reports are highly misleading," Comey said to Cruz. "And in a classified setting I could explain to you how."